This is the best gas-electric hybrid car for you if you prioritize proven technology and admire otherworldly styling. The ’18 Prius returns as a compact-sized four-door hatchback called the Liftback and a smaller, less popular variant called the Prius C. The larger wagon body style, dubbed Prius v, has been discontinued in North America. The Liftback is unchanged for ’18, while the subcompact Prius c gets freshened styling and adds safety features. 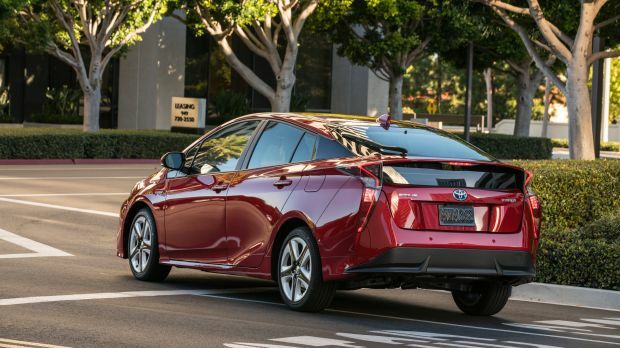 The Liftback is available as a conventional hybrid or as a plug-in hybrid marketed as the Prius Prime. The Prius c is a conventional hybrid. The first-generation Prius launched in Japan in 1997 and in the U.S. for model-year 2001. Combined with the 2004-2009 and 2010-2015 generations, plus today’s version introduced for 2016, Toyota has sole more than 6 million Prius cars worldwide, making it the most popular hybrid ever. However, sales have declined steadily over the past 24 months, buffeted by low gas prices, competition from other alternative-fuel vehicles, and the market’s shift to crossover SUVs. Volume fell more than 20 percent in calendar 2017, though at more than 108,000 units, it remained far and away America’s top-selling alternative-fuel vehicle. Should you buy a 2018 model or wait for the ’19? Go for a 2018. 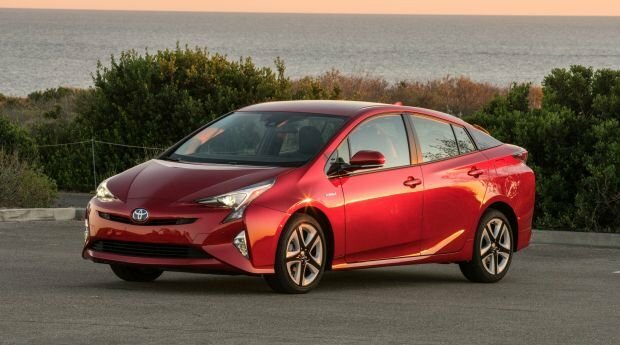 In terms of styling and mechanicals, the Prius and Prius Prime got no major changes for 2018. The redesigned 2016 Prius was the first vehicle to adopt the “Toyota New Global Architecture” (TNGA), the brand’s newest modular platform that will underpin most future front-wheel-drive-based vehicles produced by Toyota and its premium Lexus brand. The Prius Prime debuted for model-year 2017, boasting numerous advancements over the last Prius Plug-In, sold from model years 2012-2015. In addition to longer electric-only range, the Prime is available in all 50 states (the last model was offered in select markets) and at a much lower price. Expect the 2019 lineup to mirror the 2018 roster, with Liftback trim levels ascending through One, Two, Two Eco, Three, Three Touring, Four, and Four Touring models. Likewise, the Prius Prime lineup of Plus, Premium, and Advanced grades. The Prius c should reprise One, Two, Three, and Four trim levels. It received substantial updates for 2018, with revised styling and more standard equipment, including the addition of several valuable driver-assistance features. Styling: Styling wise, the fourth-generation Prius Liftback was a radical departure from its predecessor. In an effort to try and make it look more sporty, designers employed a very angular look. The headlamps sweep dramatically upward toward the passenger compartment. The rear lights do the same thing, but in reverse. This treatment serves as bracketing to a prominent cut line across side, that seems to diverge into two separate paths on the rear door. The public and the press criticized the look as overdone and haphazard, and we tend to agree. The refreshed Prius c adopts some of the Liftback’s styling elements, such as the swept headlights, but its overall look is much more restrained, which works to its benefit. Inside, both the Liftback and c employ a center-mounted instrument cluster with fully digital readouts. It can be customized to show a variety of data, including battery charge and energy consumption, real-time fuel-economy, audio, and navigation (if equipped). For 2018, the Prius Four and Four Touring models receive an upgraded 11.6-inch high-definition infotainment screen, with crisper graphics and a landscape orientation that looks like what you’ll find in current Tesla and Volvo vehicles. All grades offer Toyota’s proprietary Entune infotainment system; neither Apple CarPlay nor Google Android Auto is available. The company has improved Entune’s usability over the last couple model years, and combined with faster back-end hardware, the overall system is smooth, responsive, and intuitive. The only major annoyance is an incessant beeping noise that happens when you put the car into reverse, and there’s no way to disable it. Passenger comfort is generally good in all models. Seat padding is a bit thin, but it shouldn’t be an issue unless you’re driving cross-country in a single go. Note that the Prime seats four, rather than five, with the middle space in the back taken up by a console with cupholders. Cargo capacity is also a strong point, at least on the Liftback and c. Prime models have a raised floor in the back, which limits the height of items that can be carried – even grocery bags can get squished. At least the included cargo cover is made of a flexible, wetsuit-like material, so you (most likely) won’t outright crush anything. The Prime’s included 110-volt charging cable doesn’t fit particularly well under the cargo floor, so that can take up precious space in the main bay if you wish to take it with you. Aft visibility is a sore point for the Liftback and Prime due to a bar that extends across the rear glass. Interior materials quality isn’t great, either. There’s lots of unpadded, shiny plastic sprinkled throughout the cabin. Toyota tries to disguise this with body-color accent pieces, but the effort rings hollow. Mechanical: Prius Liftback and c employ the latest iterations of Toyota’s tried and tested “Hybrid Synergy Drive” system. While the technology has improved, its basic formula has remained the same. All models pair a four-cylinder gasoline engine with a battery-powered electric motor. They can run on one or both of their power sources, with the ability for owners to select among Eco, Normal, and Sport modes, depending on driving conditions. The Liftback and Prime combined a 95-horsepower 1.8-liter gas four-cylinder engine with electric-motor assist for a net 121 horsepower. The Prius c has a 73-horsepower 1.5-liter four and 99 net horses. Toyota does not publish net torque numbers for the gas and electric motors. The sole transmission for all is a continuously variable automatic (CVT). While the Liftback and Prius c can travel for short distances (about 1 mile) at low speeds (less than 25 mph) solely on battery, the Prime is much more capable. Its range is up to 25 miles and there’s no speed restriction. A depleted battery can charge in about 6 hours from a standard 110-volt household outlet, meaning that investing in a high-output home charging station isn’t as necessary as it might be with other plug-in and dedicated battery-electric vehicles. If you already have a 220-volt charger, a Prime can get fully juiced in about 2 hours. Dedicated conservationists will want to keep their Prius in the Eco driving mode, which noticeably dials back throttle response. Normal allows these cars to feel only slightly slower than a comparable gas-only subcompact or midsize sedan. Sport mode unleashes the electric motor’s full power, and engaging this setting makes the Liftback and Prime feel very lively. No Prius handles exceptionally well. The steering is lifeless, and the body leans noticeably even when taking turns at modest speeds. The ride quality makes up for this somewhat, as it’s quite compliant, despite the car’s use of fuel-saving ultra-low-rolling-resistance tires. Said tires can kick up a fuss on coarse pavement, causing more noise to enter the cabin than you might expect. Features: Starting with the Prius c, the One grade is basic, but it does include, LED taillights, automatic climate control, and Toyota Safety Sense C (TSS-C). The latter is a suite of driver-assistance features that includes lane-departure warning, automatic high-beam headlights, and automatic emergency braking. Two versions add cruise control, cargo cover, split-folding rear seatbacks, and a 6-way manually adjustable driver seat (versus 4-way on the One). The Three adds keyless entry with pushbutton start and upgraded Entune system with imbedded GPS mapping. The Four gets Toyota’s SofTex leatherette upholstery with heated front seats. The Prius One Liftback has similar equipment levels as the One c but adds keyless entry/pushbutton ignition and Toyota Safety Sense P (TSS-P), which includes all TSS-C features plus adaptive radar cruise control and pedestrian detection for the pre-collision alert system. The Two and Two Eco are equipped similarly to the Two c. The Three adds a SoftTex-wrapped steering wheel, specific exterior and interior trim, imbedded navigation, and wireless smartphone charging. Three Touring models get Toyota’s SofTex imitation leather upholstery and fog lights. Four and Four Touring add the larger infotainment screen, power driver seat, heated front seats, blind-spot alert with rear cross-traffic detection, and a wiper for the rear window. Front- and rear-obstacle detection and hands-free parallel parking are exclusive to the Four Touring. The Prius Prime Plus, Premium, and Advanced are comparable the Two, Four, and Four Touring versions of the Liftback, respectively. Unique to the Prime Advanced are rain-sensing windshield wipers, LED fog lights, and a head-up instrument display. While the Prius c is $480 more expensive than it was for 2017, Toyota is holding the line on pricing of most Liftback models, with only the Four and Four Touring seeing an increase of $550. The One has a 2018 starting price of $24,370, the Two lists for $25,580, the Two Eco for $26,060, the Three for $27,630, the Three Touring for $29,010, the Four for $30,580, and the Four Touring for $31,460. The Prius Safety Plus Package for the Two, Three, and Three Touring adds blind-spot alert with rear cross-traffic detection, rear-obstacle detection, and hands-free parallel parking. It costs $1,000, but Toyota is offering a credit for the full amount, so it’s essentially free. A similar package for the Four and Four Touring includes only obstacle detection and park assist. It’s $500, but as with the other version, there’s a $500 credit. An Appearance Package includes piano-black side skirt rocker panels and two-tone front and rear bumpers. It costs $1,410-$1,540 depending on trim level selection and is not available on the One. Prius Three and Four models offer an Advanced Technology Package for $1,350 that includes a head-up instrument display and a power sunroof. Four and Four Touring have the Premium Convenience Package for $1,205 that adds Toyota Safety Connect telematics and a JBL-brand audio system. Prime models see no price increases for 2018. They start at $27,995 for the Plus, $29,695 for the Premium, and $33,995 for the Advanced. The only factory option is extra-cost paint for $395. Our picks in the Prius family would either be the Two Eco or the Prime Plus, as they have the best balance of features and outstanding fuel-economy ratings. Other manufacturers are catching up, but this remains one of the most frugal vehicles you can buy. EPA ratings for the 2018 Toyota Prius c are 48/43/46 mpg city/highway/combined. Prius Liftback models, except for the Two Eco, rate 54/50/52 mpg city/highway/combined. The Two Eco swaps the otherwise standard Nickel-Metal Hydride battery for a lighter Lithium-Ion unit of similar capacity. 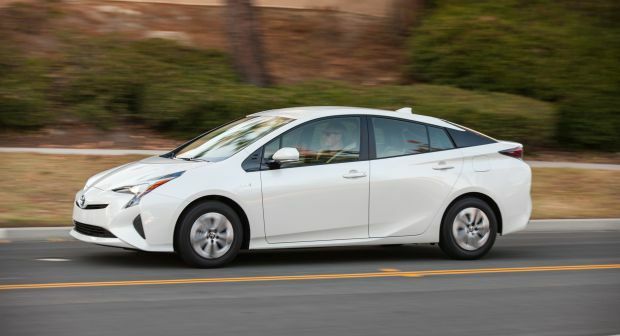 The change helps the Two Eco save up to 70 pounds of curb weight over other Prius models. When combined with additional aerodynamic tweaks, it achieves outstanding fuel-economy ratings of 58/53/56 mpg; owners and other media outlets are frequently reporting numbers even better than this – often more than 60 mpg. Prius Prime models get EPA ratings of 133 miles-per-gallon equivalent (MPGe) with the battery and gas engine and 54 mpg combined with just the gas motor. The EPA claims the Prime will have a maximum driving range of 640 miles. September 2017 for the Prius c, November 2017 for the Prius Liftback, and January 2018 for the Prius Prime. Liftback and Prime models are due for a styling and/or content refresh for model-year 2019, but with sales tracking below expectations, it’s entirely possible Toyota could stay the course. Should the update proceed, expect toned-down styling with more rounded edges. The large 11.3-inch infotainment screen might make its way to more models, along with the Two Eco’s lighter weight lithium-ion battery pack. A new-generation Prius is unlikely before model-year 2022. As the Prius c has been freshened for 2018, expect it to stand pat until at least 2021, when it could be redesigned, or more likely, discontinued outright. Honda Clarity, though it comes as a plug-in hybrid, pure electric, or hydrogen fuel cell version, only the former is available in all 50 states. Hyundai Ioniq, which tries a bit too hard to be like the Prius, even down to its rather goofy styling. Chevrolet Bolt EV, which boasts nearly 240 miles of pure electric driving at a comparatively affordable price. Chevrolet Volt, pricier and a bit less practical in terms of passenger and cargo accommodations, but this plug-in hybrid is far better looking and has more electric-only driving range. Kia Niro, a more conventionally styled, practical, and better driving hybrid that now offers a plug-in variant.